The Happy Travelling Family: Travel Tip Time: In case you lose the kids! When travelling with kids you are always extra cautious. I always make sure I pay extra and take the 'well known tour' etc. because I need to make sure that we are really safe because we have the kids. Losing the kids is always a big worry, especially when you travel to places that are crowded or if you have a child like me who likes to wander off! So I have found something which I think is great so I am sharing it here. Temporary tattoos that are custom made for you! How good is that? You put them on your kids, they can come off easily when you don't need them and if the kids get lost if someone finds them they can then find you. You can order them HERE. I haven't ordered mine for our upcoming trip yet but I will be soon. I am actually still deciding what to put on mine. Do you have any ideas? We are going to be in Asia, visiting 4 different countries. We won't have our mobile phones on global roaming due to the fees. So what number do we put on our tattoos? I'm thinking my sisters phone number back home as she will know our itinerary and where to contact us. Can you think of a better solution? Please let me know if you can. If not I may have to succumb to taking the mobile phone. Anyway I hope this tip helps you. These are even great to have for trips you do from home like to the beach or museum or anywhere really. 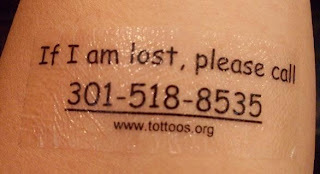 That is a great idea, I usually write our mobile number on their arm with a biro. What did you decide to put on there? I have been told to write it on in permanent marker!